Since 1994 Japan tour of UFO played a dramatic reunion in the lineup, including Michael Schenker, Tokyo Nakano Sun Plaza concert June 16 is determined by the release ultra-high quality audience master of full first appearance! Sound board sound source of official class is known in the same live, but at the highest sound quality, such as surpassing even the most classic, special performances Tokyo’s revives here! One that can be used to enjoy from a new audience perspective, the pattern of the Japan tour, which is also noted in the history of the band, is the appearance in the 2-Disc Limited press CD of fan must listen must-have! 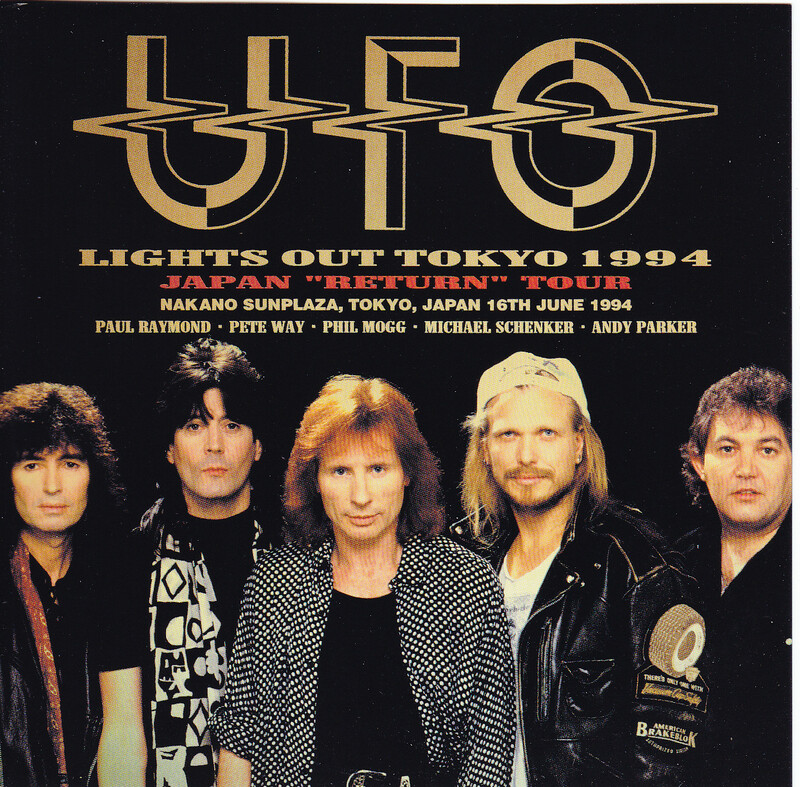 And until now from the band formed, announced masterpieces of numerous and various guitarist, UFO led by Phil Mogg, has been showing off the wonderful performances in various parts of the world. Continue to work and facing a certain guitarist of arms Atomic Tommy · M and colleagues Paul Chapman in the 80s, Lawrence Archer, and Vinnie Moore In recent years, the band each further activities resuming 90s it came to support the backbone. But things Speaking of what remains to lock history, that comes down to activities with Michael Schenker again. 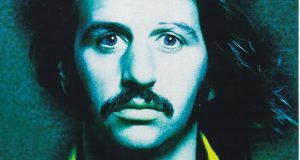 As a masterpiece of official “STRANGERS IN THE NIGHT” is telling, live in their ’70 ‘s, has been colored by tremendous performance to ghastly. Can tell you, or comparable to it as “was over” is a reunion concert That Took place Between 1994 from 1993. Reunion UFO That home to the Michael Schenker, HAS REALIZED the Japan Tour of the long-awaited in June 1994. Japan of “UFO Michael to Play” The Earnest desire Itself for fans More Fan of Japan. Meet it IS to BE REALIZED finally, Japan Tour of Reunion UFO Became a big topic. Sound board Sound source in Tokyo Nakano Sun Plaza Concert June 16 IS, HAS Become a major staple in the quality of the Official class in this Concert in Japan. Sound source of upgrades and is pressed on CD as “FORWARD TO RETURN” masterpiece of Langley label “THE RETURN TOUR 1994” is known, even in recent years, can not be avoided for UFO fan “Absolute must listen previously it is a live show.” “But records of the stage side” is too intense too, but this live therefore, “recording of the audience side” they should be in the live recordings, that audience recording item was missing. Unfair to be able to feel the excitement of the Audience in How great Live. Avid mania about, or Would not BE Were looking forward to the advent of Audience Recordings Superior? Its “record of the Audience side” That HAD Been missing, Kisekinohakkutsu Original DAT Master of the highest quality That Are not floating around also absolutely trader between this time! Recording’s, name taper also Michael Schenker “THE MOVING ELEMENTS” In addition, worked calling that masterpiece of DIO Japan sound source is also high the “DRAGON HEAD”. Addition to the direct sense of ease to hear the best approach to sound board sound source, vividness, and the enthusiasm of the hall, which could not be felt in the sound board (Metallica hot topic “YOKOHAMA 1993!” With ultra-high quality of startle in recent years) and vacuum packs , you can revive the color vivid live in one of the best UFO! In live official class sound board is present, if those of …… mania audience recording of the first appearance is pressed on CD suddenly, the quality of “this recording is whether the level of how you have this one point you might guess will stick with. “But fact is, great beyond the imagination! Direct feeling of the line class and clearness that the major premise no longer outstanding. The feeling of air that has been backed by the spread of sound wide, I am amused with plenty in the sense of reality just like the live site. It is the cause suddenly realize it, acoustic part of Michael prior to the live volume. It is a real than the sound board sound source to be honest, guitar tone clear of Michael listen here, feel the “Warmth” Above all. Glossy tone and exquisite Echoes, Would Groan fans More Fan all heard a tone. And in the main Part of the set as a UFO, Tension and excitement That Rises from the intro IS unbearable! At the opening of “Natural Thing”, climax and excitement of the audience, such as raged is a rarity. Listeners also, will bound to sense that you are participating in live at the venue actually in this! Classic uplifting feeling Aktiv waviness heavy of “Mother Mary “, and the delicacy is Konjiru enters” This Kids “, guitar Michael is paid out in the tone a sharp such as” Hot ‘N’ Ready, “” Too Hot To Handle “from many of the wonderful performances, taste of live recording unique superior has overflowed. Is the rich in Gotae listen above all it would be “Only You Can Rock Me”. Chorus the audience a large chorus in response to the aftermath of Phil scenes you want will enjoy. Unlike the sound board was “one -way “most, many times realism and juicy heat a Lively the audience to react to Vivid is also great listening! This field experience is unique audience recording excellent! Such lyricism and dramatic is portrayed in sound vivid color to” Let It Roll “, “Out In The Street” and “Love To Love”, scenes, not breathtaking in hand to hear from one minute to the next In addition to barrage. Is the climax of the live “Lights Out,” “Doctor, Doctor” and ” rock Bottom “Are ALSO Paid out in strong force like Being in front of the band! After you Have finished the main set featuring Rongusoro That Saewataru of Michael in “Rock Bottom”, “Shoot Shoot”, “C’Mon Everybody” Explodes the encore and more! The Tokeai mood and they both “have fun playing” the band’s enthusiasm of the audience, mood Suponteniasu spreads full stadium. The realism perfect score over the whole volume. Lid taste a little bit also different from the sound board, this Sound …… of venues Pojitivu Spewing everywhere what IS the charm of the only Audience Recording! 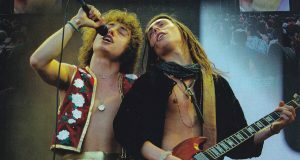 Or (Part of the 16 Day-Night December) Concert in Japan last Day in 1976 of RAINBOW, as Typified by Tokyo last Day in 1980 of BLACK SABBATH on (November 18), in the “live special” in Japan, audience sound source, which is noted in both the sound board and recording have been preserved. It is believed that words, precisely because there is a multifaceted view these live is also placed in the “special”. The present recording, which appeared this time, Japan Tour 1994 of UFO also, will that future is told in the position rose from the conventional one-stage! This work carved in super sound like over to the sound board sound and vivid in the live recording of the superlative, the pattern of live that also remain in the band ever, in a single lining up large, a standard for “FORWARD TO RETURN” it is no doubt that you will! I think this one not to be missed absolutely for fans of UFO and Michael, and I would like you to get this opportunity, the CD2-Disc Complete limited press of permanent preservation version! Since 1994 Japan tour of UFO played a dramatic reunion in the lineup, including the Michael Schenker, Tokyo Nakano Sun Plaza concert on June 16 is, release determined by the full debut of ultra-high quality audience master! Although the official class of sound board sound source is known in the same live, at the large classic even the best sound quality, such as surpass, special Tokyo performance revives here! The pattern of the Japan tour, which is also noted in the history of the band, one to be enjoyed from a new audience point of view, is appeared in the 2-Disc Complete limited press CD of fan must listen must-have! 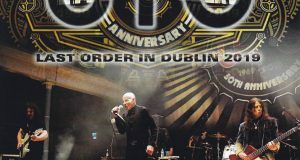 Phil Mogg led by the UFO, from the band formed until now, announced a variety of guitarist and many of the masterpiece, has been showing off Meien in various parts of the world. Continued in the ’80s and facing a certain guitarist Paul Chapman and Atomic Tommy · M et al arm activity, 90s activities resume at the time of the Lawrence Archer, further in recent years and Vinnie Moore, of each band We came to support the backbone. But Speaking of things that remain to lock in history, still things that comes down to the activities of the Michael Schenker. They live in the ’70s, as the official of the masterpiece “STRANGERS IN THE NIGHT” is telling, has been colored by tremendous performance to approach Kiki. Or comparable to it, or that said that “was over” is a reunion concert that took place Between 1993 1994. 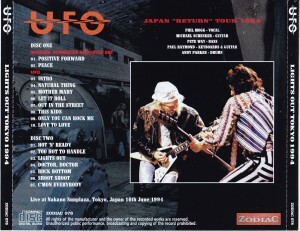 Reunion UFO that home to the Michael Schenker, has realized the Japan tour of the long-awaited in June ’94. Japan is earnest desire itself of the “UFO Michael to play” for the Japanese fans. Meet with it finally realize, Japan tour of reunion UFO became a big topic. Sound board sound source in Tokyo Nakano Sun Plaza concert June 16 in this visit to Japan performances, has become a major staple in the official class of quality. 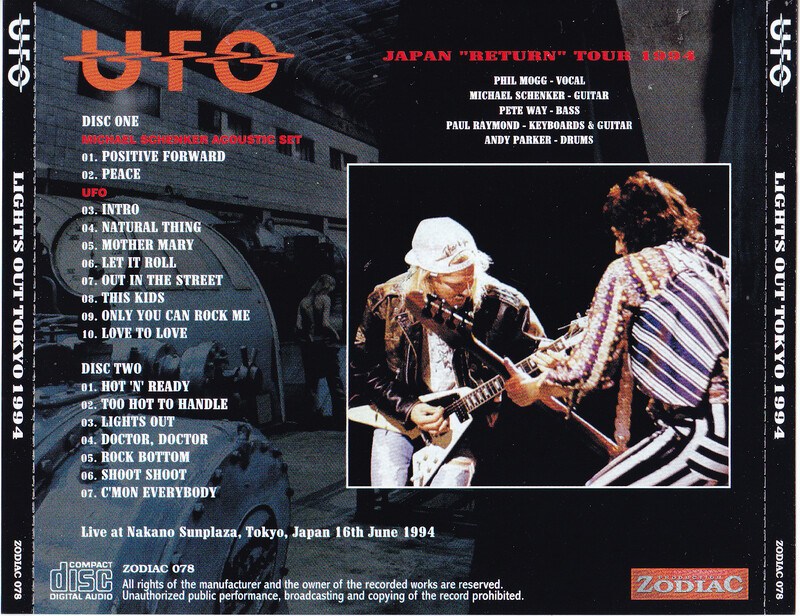 Previously known masterpiece “THE RETURN TOUR 1994” in Langley label, such as the sound source of upgrade, even in recent years is pressed on CD as “FORWARD TO RETURN”, can not be avoided is for UFO fan “is an absolute must listen It is live for “. However therefore This live is the “stage-side recording” is too too intense, should be originally in the live sound source “of the audience side recording”, ie audience recording item was missing. Unfair to be able to feel the audience of excitement even in how wonderful live. The more avid mania, I think than had been the emergence of excellent audience recording to look forward? This time, the missing had been “the audience side recording” is, excavation of the miracle at the highest sound quality of the original DAT master not been around at all even between traders! Recording person, “THE MOVING ELEMENTS” in the same Michael Schenker addition, name taper worked a higher calling that masterpiece of DIO Japan sound source “DRAGON HEAD”. (Recently in the “YOKOHAMA 1993” also! Metallica topics in ultra-high sound quality of startle) was added to the highest listening ease approaching also the sound board sound source and direct feeling, vivid in the sound board could not be experience, and the hot air of the venue and vacuum packs, and revived the UFO one of the best live in vivid color! In live official class sound board is present, and if more of …… mania that audience recording of the first appearance is suddenly pressed on CD, or quality of “this recording by this single point of is how the level “and you can imagine would stick. But fact is, great beyond the imagination! Superb clearness and line class of direct feeling is no longer major premise. Air feeling that has been backed by the spread of wide sound, let plenty of entertaining live at the scene just like the sense of realism. And that to suddenly realize it, Michael acoustic part prior to the live main. Here listen to Michael’s clear guitar tone is a realistic than the sound board sound source to be honest, makes above all feel the “warmth”. Exquisite echo and glossy tone, I would groan all fans were listening to musical sound. Then, in the main set as a UFO, excitement and tension that rises from the intro is unbearable! At the opening of “Natural Thing”, excitement and excitement of the audience, such as Gushing is a rarity. Hand to listen to this also, it would actually bound by the senses that are participating in the live at the venue! Swell of heavy of “Mother Mary”, mix contains the delicacy and Aktiv an uplifting feeling “This Kids”, such as Michael’s guitar is fed out in the sharp tone “Hot ‘N’ Ready,” “Too Hot To Handle” classic from many of the Meien, it has flooded the taste of excellent play-by-play recording unique. That is rich in above all listen Gotae it would be “Only You Can Rock Me”. Chorus part of the audience in response to the aftermath of Phil is a big chorus you want Enjoy all means scenes. Unlike most “one-way” was the sound board, Lively heat and juicy realism the audience to react to vivid great also heard many times! This field experience is excellent audience recording unique! “Out In The Street” in the “Let It Roll” is also to be portrayed in a colorful sound addition, such as dramatic lyricism of “Love To Love”, breath in hand listening unexpected also crowned name scenes from the next to the next barrage. It is a live of climax “Lights Out,” “Doctor, Doctor” and “Rock Bottom” will also be paid out in strong force, such as band in front of the eyes! After you have finished the main set in featuring Rongusoro the freeze of Michael “Rock Bottom”, “Shoot Shoot” further “C’Mon Everybody” explodes in the encore! Both are Tokeai the mood of hot air of the audience is “enjoying the performance” of the band, spreads Suponteniasu mood in the hall full. The realism perfect score over the whole volume. Spewing everywhere Positive venue of sound …… This is what, a little bit to the sound board nor different lid taste, is the charm of the audience recording only! 1976 Japan tour last day of RAINBOW and (part of the December 16-night), as typified by the 1980 Tokyo final day of BLACK SABBATH (November 18), in the “special live” in Japan, audience sound source to be noted in both the recording and sound board has been left. In other words, precisely because there are these multi-eye perspective, we live it is also considered to have been positioned in the “special one”. With the advent was this recording this time, in 1994 Japan tour of UFO also, you’ll be in the future is told in positions that went up one step from conventional! The live of pattern that remains in the band history, vividly in the superlative of play-by-play recording, and this work that engraved in super sound like over the sound board sound source, to one that is arranged in the large classic “FORWARD TO RETURN” it is to be definitely! One that can not be missed for Michael and UFO fans, a fully qualified press CD2 Disc of permanent preservation version, I think I would like you to come get this opportunity!